Okay so I told you that I made 3 cheesecakes on Sunday. We started off on Monday with my rich and decadent Caramel Cheesecake. Then on Tuesday I posted my White Chocolate Cheesecake with Peanut Butter Cup topping. And now the final presentation and one of my favorites....A chocolate and coconut covered cheesecake that is to die for! Tastes like a Mounds Candy Bar! Pre-heat the oven to 375 degrees. Combine the graham cracker crumbs with the melted butter and press into the bottom and 1 1/2 inches up the side of a 10 inch spring form pan. Bake for 10 minutes and then allow to cool completely on a wire rack. Reduce the heat to 325 degrees while crust is cooling and you make your batter. Place the chopped white chocolate into a heat safe bowl and set aside. Bring the 1/2 cup of cream to a simmer over medium heat in a small sauce pan. Pour the hot cream over the white chocolate, and allow to stand for one minute. Stir the chocolate gently until melted completely. In your mixer, beat the cream cheese until smooth and lump free. Add the sugar and mix, scraping down the sides of the bowl as needed. On medium speed, slowly add the white chocolate mixture. Once combined you can add the eggs, one at a time, beating on low speed until each egg is incorporated. Once you've added all the eggs, mix in the vanilla and salt and pour into your prepared crust that has cooled in your spring form pan. Set the pan onto a couple of heavy duty, large sheets of aluminum foil and smooth them up the sides of the pan to waterproof. Set the cheesecake into a large roasting pan and then place in the oven. Pour the boiling water into the roasting pan, filling to about one inch. Bake at only 325 for the first hour and then reduce heat again down to only 300 degrees and bake for another hour or so or until the center is just set. Remove from the oven and allow to cool completely on a wire rack. Once cool chill in freezer for at least an hour before adding topping. Add water to a large pot and bring to a simmer. Place a heatproof glass bowl over the pot and add the chocolate and heavy cream. Slowly stir with a spoon until the chocolate has melted, careful not to incorporate too much air. Once melted, remove from heat and allow to cool for about 10 minutes. Pour chocolate ganache over frozen cheese cake and allow to drip down sides. 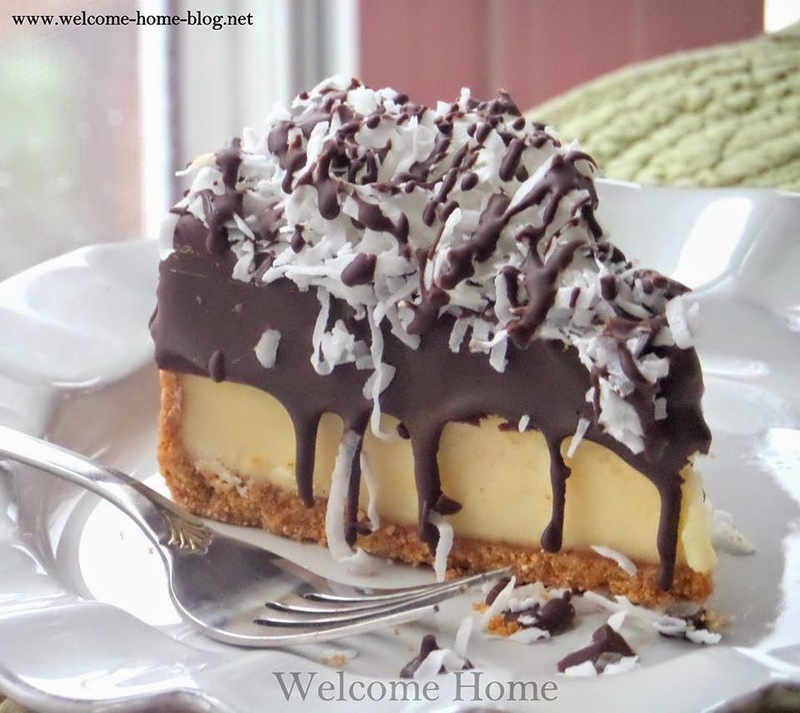 Top generously with coconut and then drizzle or dot chocolate Shell on top.